Even though this is not a “Health and Nutrition” blog per say, I definitely care a lot about health, weight loss and nutritious recipes. I am not an exercise fanatic. Nor am I obsessed with eating only vegetables (have you seen how much I love desserts?). But, I definitely do care. This will probably be the first of many posts about my attempts to be healthy, but before I say anything about my health goals, I have to speak about the key to all my healthiness – the key to losing weight. This one thing is the crux of everything I do. I live and breathe by the Lose It App. Several years ago my husband decided we were going to count what went in our bodies (actually…count the calories). I’ve always cared about what I eat, so why not? We started using Lose It and haven’t stopped. I have counted every calorie I have eaten for the past 2 1/2 years. Pretty cool, eh? Since I’ve been using this app, I’ve lost about fifteen pounds. It’s not a ton, I know. But, because of this app I am definitely more healthy and aware of how my body uses food. You need to burn 3,500 calories to lose one pound of fat. To lose one pound per week, you need to burn 3,500 calories, or 500 calories per day. 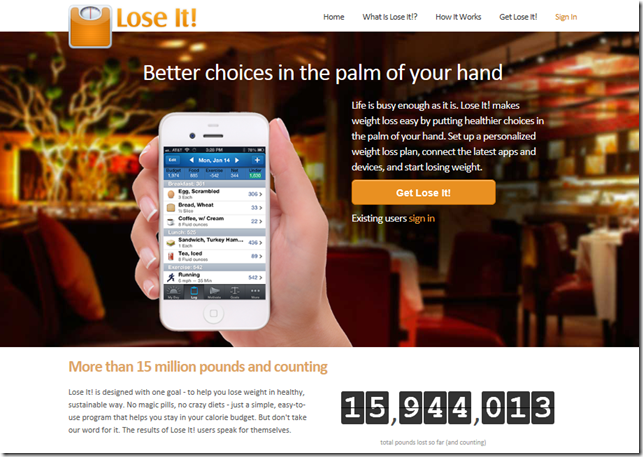 Lose It calculates your gender, weight, height, and weight loss goal – and tells you how many calories you need to consume. The food you eat, and the exercise you accomplish, work together to get you to that goal. If you don’t want to lose weight, but just need to maintain it, Lose It does that too. It is a great regulator – whatever your goal. For me, I really just love the knowledge of what goes into my body. I love knowing that at Wendy’s, the Junior Bacon Cheeseburger is only 390 calories while the Baconator is 970! Still a burger…but a huge difference! I still eat crazy stuff sometime, but at the end of the day I know exactly what I ate and if that will affect my weight. It’s all about the knowledge, baby. If you need to be held accountable for everything you eat – check it out!